No matter where you stand on the concepts of ‘fate’ and ‘destiny’, you have to admit there are certain stories that make you question if we’re not all part of something bigger than ourselves. Personally, I’m not entirely convinced by the idea that our lives are predetermined, or that we walk paths towards conclusions already set in stone. That said, whenever I hear of a story such as this one, I can certainly accept the possibility that I might be entirely wrong. 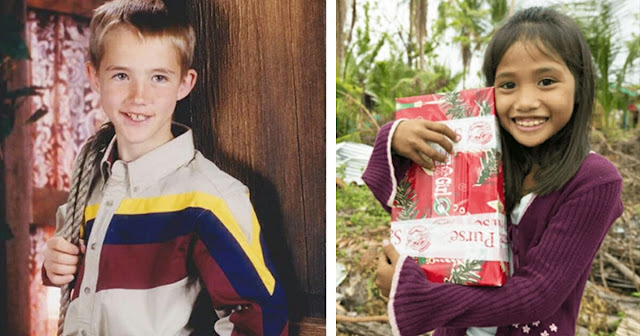 Fifteen years ago, when Tyrel Wolfe was just a 7-year-old boy, he took part in an initiative set up by international humanitarian organization Samaritan’s Purse. It included him sending a shoebox filled with school supplies, toiletries and small toys as a Christmas gift to children in various countries. Wolfe had no idea where his specific shoebox would end up; it was a decision completely out of his hands. As it happened, though, it made its way to Joana Marchan of Quezon City, Manila, in the Philippines. Joana sent Tyrel a thank you message in return, but unfortunately the note never reached him. Undeterred, however, Joana didn’t forget Tyrel over the next decade. The box “meant so much to her” that its sender remained lodged in her memory – and she had every intention of thanking him properly. Then, after 14 long years had passed, Joana finally found a way to track Tyrel down in 2011. She used Facebook to send the American a friend request. It turned out the pair actually had more than just a few things in common, including their love of Christian music and a staunch belief in their faith. The pair spent the next year conversing on social media via messages, before Tyrel decided to take a 10-day trip to the Philippines to pay Joana a visit. No sooner had they glimpsed each other in real life, did the two of them know they were meant to be. “All I knew was Joana was the one,” Tyrel told Samaritan’s Purse. Before long, Tyrel returned to the Philippines so that he could ask for Joana’s hand in marriage. Then, on October 5, 2014, the pair were joined in holy matrimony. As a nod to their beautiful origins, the newly-wed couple instructed guests at the wedding to pack Christmas boxes to give to Samaritan’s Purse for overseas children. “Operation Christmas Child is what brought Joana and me together, so we wanted to somehow make the project a part of our celebration,” Tyrel said. What a truly wonderful story of unlikely love. To think that a Christmas charity box forged a bond that would stand the test of time and bring two people together who lived over 8,000 miles apart! If this story touched your heart – I know it certainly touched mine – please share it on Facebook so that your friends and family can see it too!